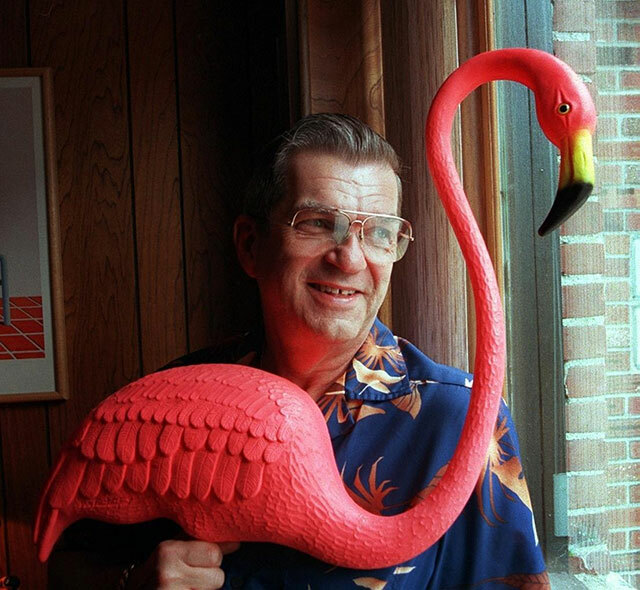 Fly your flamingos at half staff today: Don Featherstone, the man who invented the pink flamingo lawn ornament, is dead at 79. Don Featherstone, creator of the pink flamingo lawn ornament. Don Featherstone created the pink plastic flamingo lawn ornament in 1957. They hit the store shelves in 1958, and have been terrorizing lawns in flocks ever since. An artist with nine years of formal training, featherstone created over 600 products during his 43 years with Union Products. But none of them changed the world of lawn ornamentation quite like the beautifully tacky pink flamingo, which was his second assignment for the company. Featherstone didn’t have real flamingos, so he sculpted his lawn ornaments from National Geographic photos. 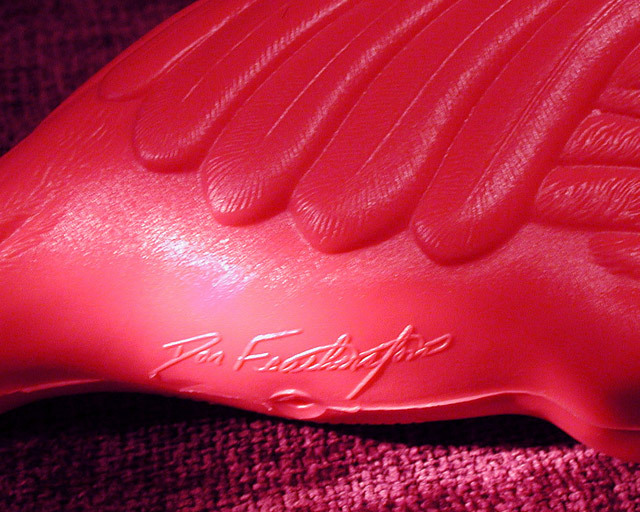 In 1987, Don inscribed the original pink flamingo mold with his signature in order to distinguish his from the knock-offs. Union Products removed his signature in 2001, but quickly replaced it when the Annals of Improbable Research and the Museum of Bad Art launched a protest and encouraged people to boycott the false flamingos. For his flamingos, Don won the Ig Nobel Prize for Art in 1996. The 1972 John Waters film Pink Flamingos, considered an abomination as well as an instant classic, was highly influential in establishing Featherstone’s lawn ornament as a mainstay of American lawns and pop culture. In 2009, the city of Madison, Wisconsin Common Council designated the plastic flamingo as the city’s official bird. Some homeowners associations forbid plastic flamingos and will issue fines due to the belief that they lower real estate values. Featherstone and his wife dressed alike for 35 years. The plastic lawn flamingo spawned a lawn greeting industry where flocks of pink flamingos are installed on a victim’s lawn at night while they sleep. Production of pink flamingos was stopped when Union Products closed up shop on November 1, 2006. However, HMC International LLC, a subsidiary of Faster-Form Corporation, purchased the copyright and molds of Featherstone’s original plastic flamingos in 2007. 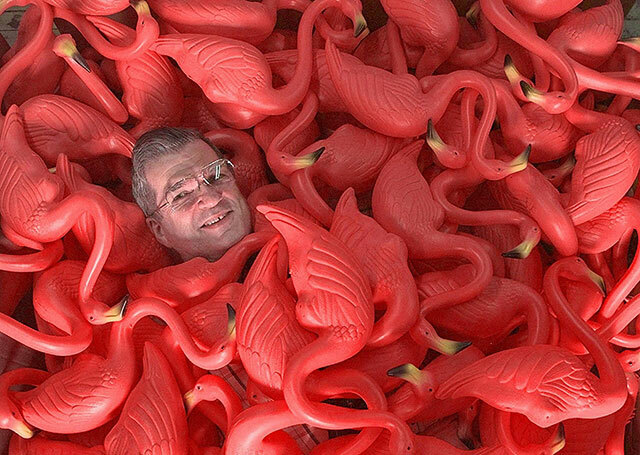 Don personally tended a flock of 57 plastic pink flamingos in his yard. How can you tell if you have a Don Featherstone signature flamingo? Don Featherstone’s signature pink flamingo. Don lost his long battle with a form of dementia called Lewy body disease and died Monday at the age of 79, a day before Pink Flamingo Day which has been celebrated in his home town of Leominster, Massachusetts since 2007. 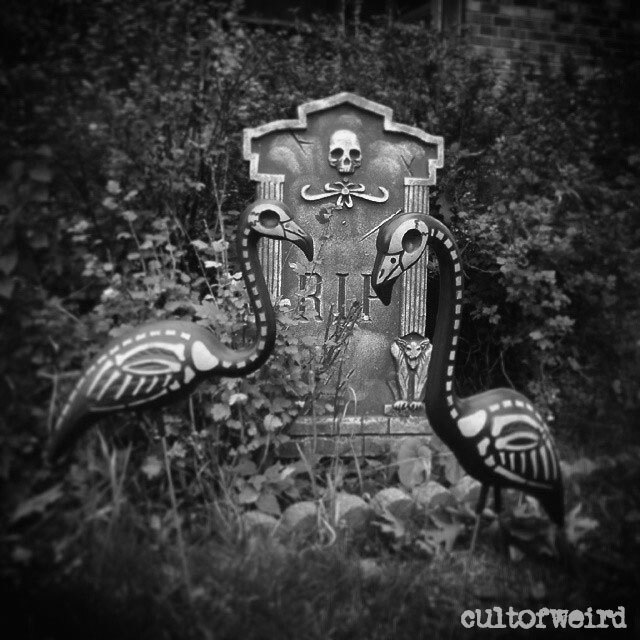 Cult of Weird HQ, Halloween 2014. Skeleton flamingos available here. Anyone know who JOHN PERRY is ? He signed, with a “copy write” Mark next to his Signature.